This is a site report, not so much an observing report. My main goal was to go to check out the surroundings. 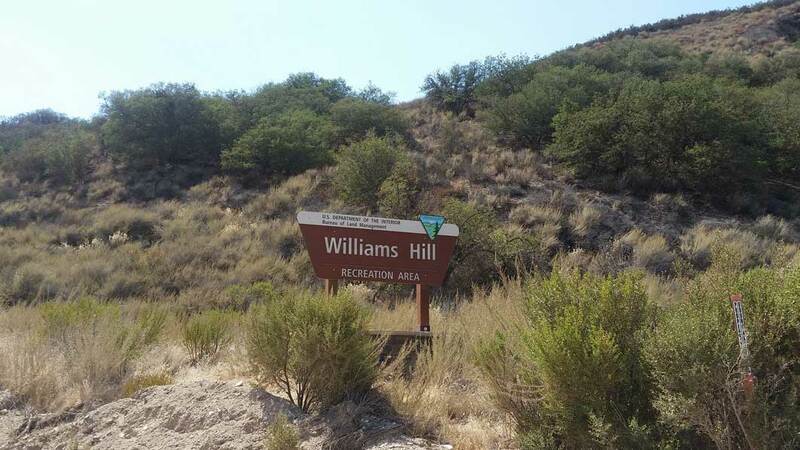 On July 30-31 2016, I went to Williams Hill Recreation Area, managed by the Bureau of Land Management (BLM), to investigate the suitability of the site for purposes of astronomical observing, with the possibility of spending the night. 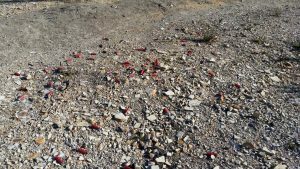 The area is located about 27 road miles, or 17 miles as the crow flies, south of King City. 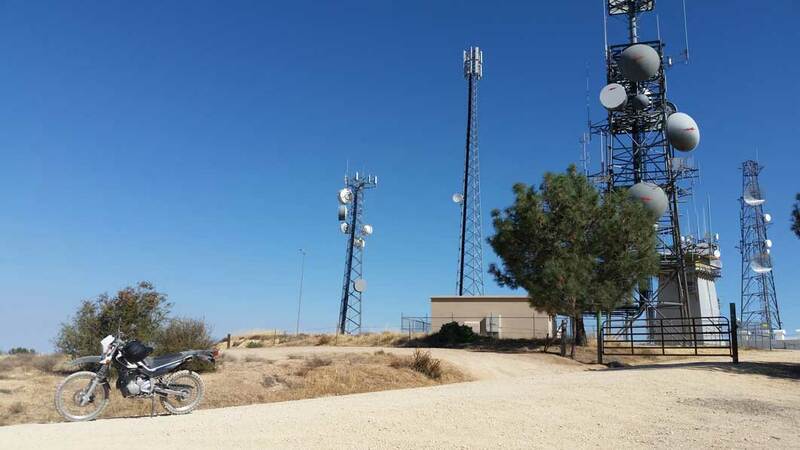 My plan was to get there earlier in the day on Saturday with my dirt bike, and then tool around to explore and get to know the area, and settling on a location where I could set up my scope. I would then have dinner, and head to that site to set up, and wait for night to fall. Things went very much according to plan. One hundred miles of this kind of view. The ride down 101 was uneventful, though slow going getting out of Santa Clara County due to Gilroy’s annual Garlic Festival. 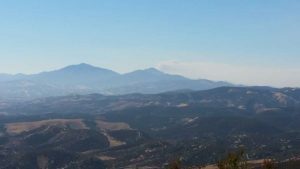 Getting through Prunedale and Salinas was also slow in spots, and much of the afternoon sky was obscured by smoke from the fire near Carmel (prevailing winds were taking the smoke northeast, thankfully away from my destination). It was over a hundred miles on southbound 101, through all the towns we know when we are traveling to dark sky sites: Gonzales, Soledad, Greenfield, King City. About eight miles of white dusty dirt road. 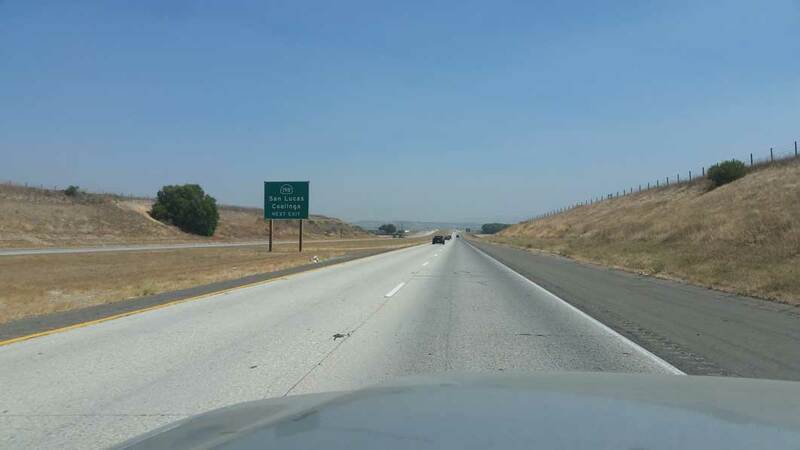 The exit to take is called San Ardo, then a right onto Paris Valley Road. 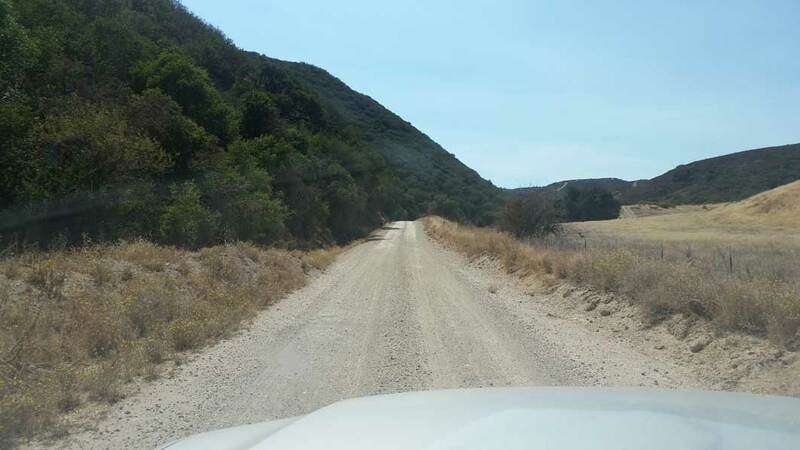 After a little less than two miles of paved farm road, you have to make a sharp left turn onto Lockwood San Ardo Road, at which point, it turns to a fairly well maintained dirt road. Once on the dirt, going was slow. I had a trailer so I took it easy, no more than 25, and in some places, 10 or less toward the top. 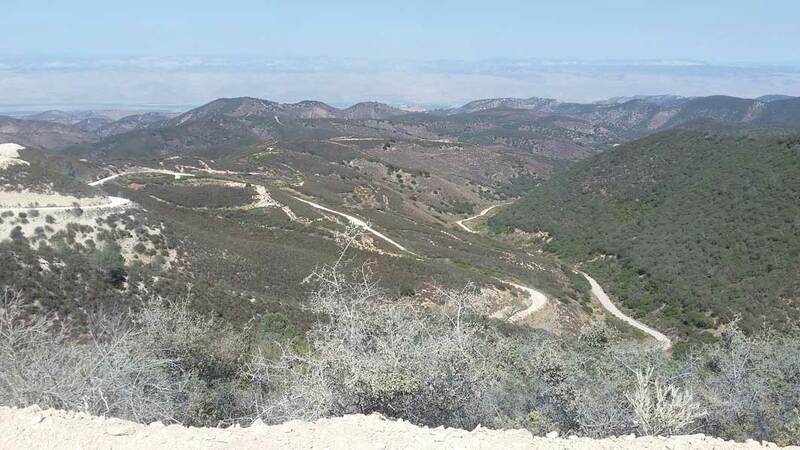 Nearing the camp, the road is cut into the side of the hill, exposing the Monterey shale formations. 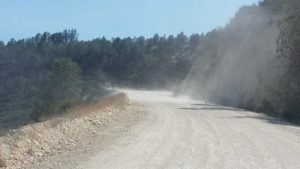 It’s a very dry, dusty white ride. Once you see this sign, you know you’ve made it! The actual Williams Hill, where all the antenna towers are. It’s four and a half miles past the campground. 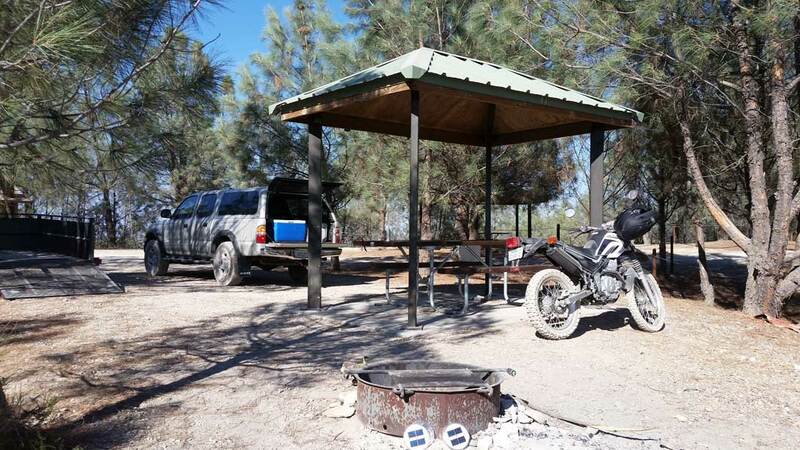 I arrived at the campground closer to 4pm, about ninety minutes later than I originally planned. 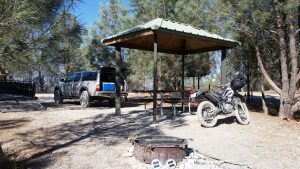 The first order of business was to unhitch the trailer and pull the bike down, getting ready for the first phase, local exploration. 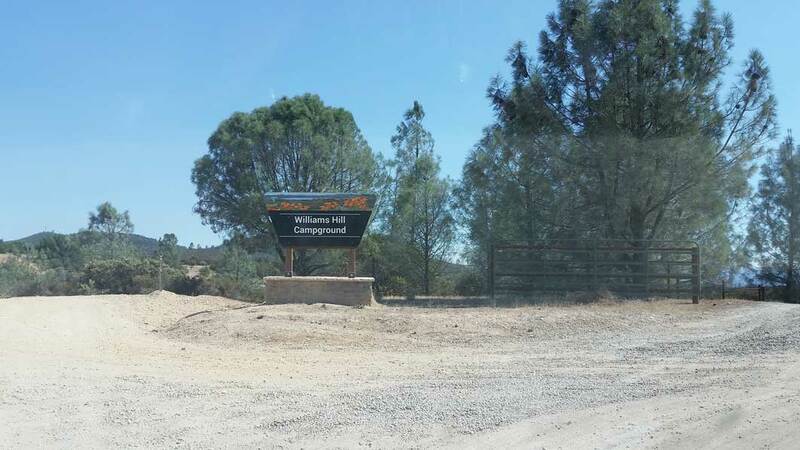 The campground is four and a half miles before the end of the road that leads up to the actual Williams Hill, which can also rightly be called Antenna Hill. I made my way to antenna hill via the fairly well maintained dirt road comprised mainly of switchbacks that lead from one hill to the next. At the top of the hill, the antennae live behind a chain link fence, some of the towers more securely enclosed than others, possibly giving away their importance to their owners. At the end of the road, there is a fairly wide area that may be suitable to set up maybe a dozen scopes, but it’s a long way to go past the campground, there are large circles etched into the ground by spinning wheels (ie, donuts), and if anyone were to come up that road at night, you’d be blasted with headlights with little to no cover. Further, the flat area, though wide open at the top of the hill with nice horizons (except for the towers), is not entirely level. Being the top of a hill, it has a mild crown, I thought to myself that this area would do in a pinch, but there very well could be better sites. 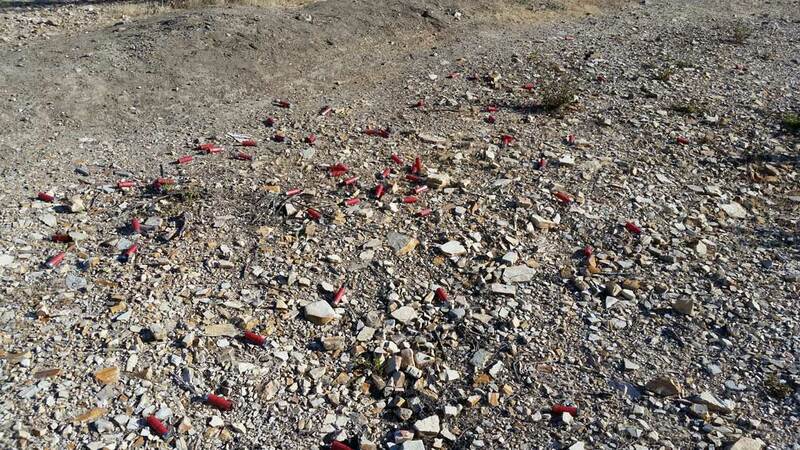 Lots and lots and lots of spent shotgun shells littered every turnout. 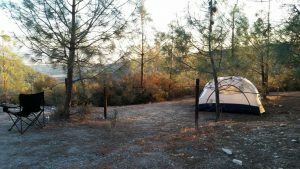 The campground is wooded with pines, though sparsely, and each of the six sites are far enough apart which provides for privacy. The location is on top of a ridge, so the wind was sailing briskly over the ridge top, making tent assembly a bit difficulty. However, it died down rather abruptly after about 7pm. 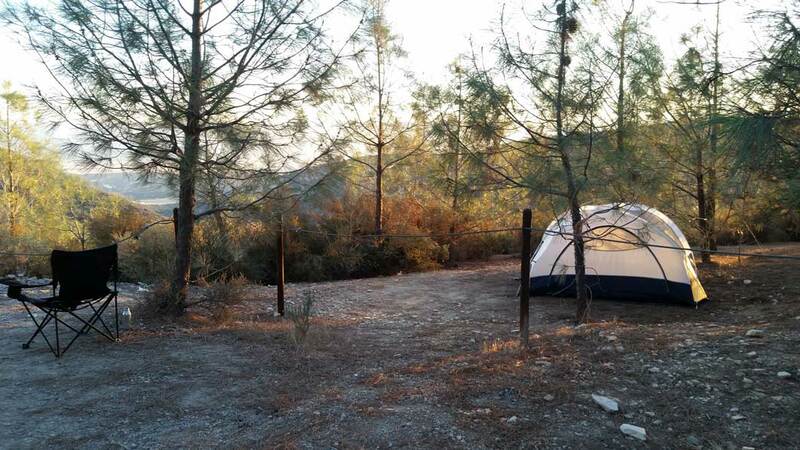 The campsite showing fire ring, canopy, picnic table. There is no water at the campground whatsoever, so any campers or other visitors are well advised to bring plenty of their own. There is a single vault toilet that was fairly (relatively) clean and even stocked with adequate amounts of TP. The sites each had a metal picnic table and a canopy as shelter from the sun, or perhaps the rain, and the sites and much of the rest of the campground were roped off to keep offroaders off the vegetation. There were other campers, including a fairly large group of young men, in about 6 cars. They were not any problem, we didn’t socialize at all, and the smell of clove cigarettes adorned the air on the road leading away from camp. There was also a later arrival, a guy with his girlfriend, out for a romantic camp getaway in the local hills. As far as observing, I don’t have much to write about. The hilltop location were I set up was mildly rutted by vehicles turning around when the ground was last wet. The ruts made it slightly challenging to find an adequately flat, level spot for the dob base. It wasn’t dusty there, but rather a bit rocky with small scrub growing low. After it got dark, I sampled Saturn, whose tilt is now so great that seeing the Cassini division is easy, and enjoyed the planets wandering through Scorpius. viewed some objects around Ophiucus but mainly I was happy just taking in the dark sky, with the milky way hanging above like fluffy clouds. A few streaks of light appeared during the night, perhaps a pre-game show for the coming Perseid meteor shower. It was very much plenty dark. The view of the road leading up to Williams Hill Recreation Area, from the top, looking east. I didn’t stay out long since I had to be out of there early. The next morning, I loaded up and took it easy down the hill again, and it was a nicer ride since it wasn’t as hot. Got back to San Jose around 11am. Would I recommend this place for SJAA members to go observing? Definitely yes. The recommendation would also include that you should plan on staying the night. Though there is no water and no trash service, and it’s a fairly remote location where shooting is allowed, it does have fairly decent cell service, a nice campground, and good horizons at 2200 feet (671 meters). Smoke from the fire near Carmel, California. Rob’s camp in the sunset. 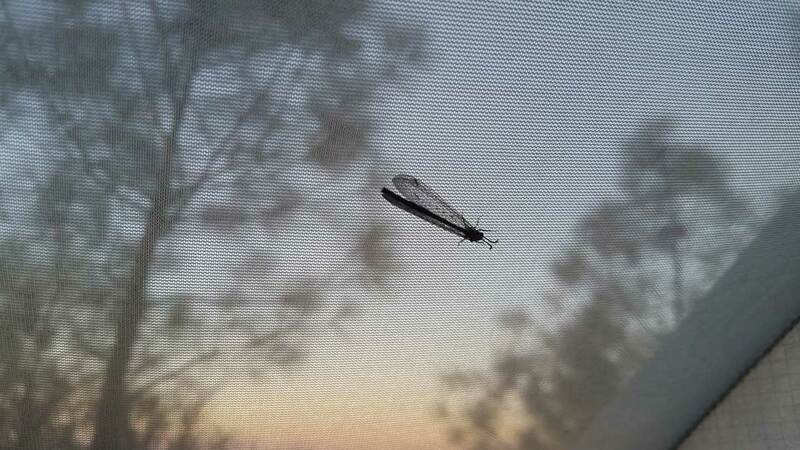 An overnight visitor, clinging to the ceiling of the tent. Afternoon wind whipped up a section of thick white dust at the one tight hairpin turn.